Pollick’s multiple blend of ten authentic natural live plants, wild grape vines, tree leaf juices and fresh earth essence. October Cover Mist is an excellent cover scent for boots, clothing, and tree stands. Its ability to effectively mask human odors with your surroundings wherever you hunt has made October Cover Mist our number 1 seller. 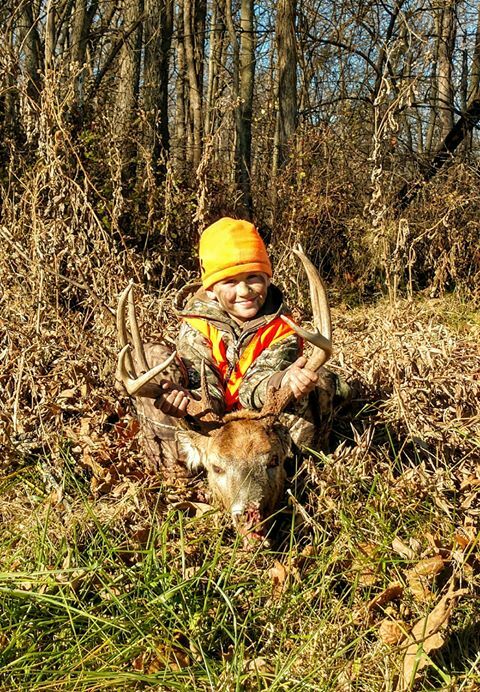 For excellent scent protection, mist your hat every couple hours during your hunt. 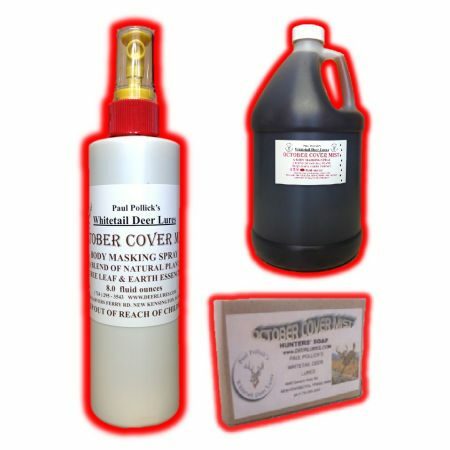 Even if you intend to hunt without the use of deer scent or lure attractors, always use a quality cover scent. Once your odor is detected, it is too late! 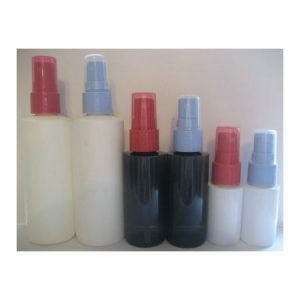 Dealers looking to expand your product line and bottle under your own label name – Call 724-295-3543 for a free 8 oz. spray sample bottle of Pollick’s October Cover Mist Scent. We can supply your needs for $55 per gallon. Made from 10 crushed wild plants, flowers, tree leaves, vines, and earth essence. 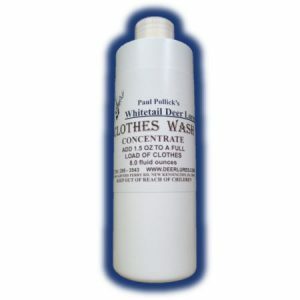 We have had complete satisfaction on this product around the US since 1995. You must smell it to believe its all-around earthy, woodsy scent. All natural, nothing like it! I used the October Cover scent mist in combination with the Doe urine, with huge success for opening day of Bow season. Had put up a ladder stand near a deer trail and sprayed it with the mist. 1 day before the opener. 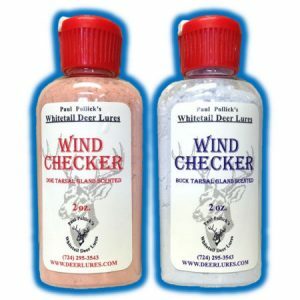 Put the doe urine in a cap that flips open to reveal a material that soaks up lure, and that is clipped to your jacket(you should offer these). Harvested a Doe, two hours into Opening day. First deer,ever, on opening day. During “chasing and seeking “, I sprayed myself with the mist and put Flaming Doe in that cap. Walked all day on my property. On and off heard rustling but, never saw anything. Sat down, behind a tree, facing a natural funnel, with the wind in my face. My bow in my lap and a nice 4pt came right up behind my and looked at me from 10’ away. I jumped about a foot, he ran behind a few trees, turned and, we shared a moment. I don’t harvest anything under a 6 so, off he went. Your product is highly effective and I recommend it to all my hunting buddies. 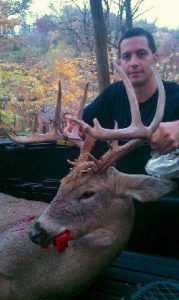 142″ 10 point. Again, I want to thank you for giving me a chance this year and hopefully it brings in the business. I was very happy with your deer scents and the October Cover Spray. I use many different products, from a variety of companies and individuals, over the years I have found the best products are made by trappers. I could tell from your description in your pamphlet that you have a very good knowledge of the whitetail deer. So last season I used only your products while bow hunting. I was very pleased with them and I also believe they are top quality. I hunted all day from October 31 till the second week of November. I had many opportunities to shoot many bucks. I did harvest a nice 8 pt. That day I saw nine different bucks pass by me and six of them worked the mock scrape I had made 15 yards from my stand. Including the one I shot. I used only your products (other than the ultimate scrape dripper from wildlife research) which I kept full of your Complete Scrape. 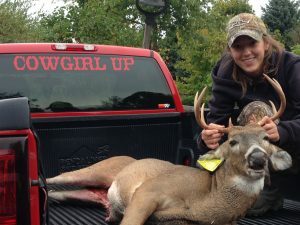 With the use of your products, it was easy for me to put out scent of an intruder buck and doe in estrus in the area. Which kept my stand area active. My mock scrape obviously became a primary scrape used by the deer in my hunting area. I am very pleased with your line of products and wish to order some more. 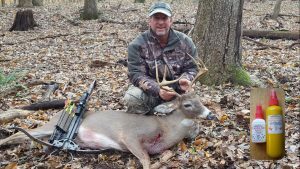 Thank you and congratulations on producing some of the best whitetail deer scents available. I shot this 8 point the morning of October 9, 2014. Every time before I walk to my stand, I spray over myself with Paul’s October Cover Mist. The deer came right up to me, not a clue I was there. I have been using Paul’s lures since I started hunting and none of them have ever failed! Thanks Paul!